The HIMOINSA Team rider is forced to withdraw from the race after completing 140 kilometers of yesterday’s stage with a wound to her left groin, due to which she lost a considerable ammount of blood. Belén (Argentina). The toughest and most difficult Dakar in the event’s 40-year history was not an obstacle to Rosa Romero’s strength and honor. She had not only completed a perfect race, but was in an excellent 66th position in the standings after having overcome complicated days both physically and mentally. However, yesterday, in the tenth stage, at the start of the second part of the special, it all went wrong for the HIMOINSA Team rider in one of the most difficult areas of the race. Just 700 meters from the start and near where many pilots got lost during the day, Rosa Romero rode through a section full of ruts and with poor visibility, where a rock caused her to crash hard. The rider was able to recover and pick up the bike, but one of the metal parts of her KTM’s cockpit (the edge of the GPS support) put a deep cut in her left leg, perforating through the pants and the protective gear at groin height, very close to the femoral vein. Far from giving up, the rider got back on the bike and completed the nearly 140 kilometers left until reaching the finish line, making her way through the desert’s night withstanding the pain. After a total of almost 9 hours of special, Rosa Romero appeared at the HIMOINSA Team bivouac with her seat completely covered with blood and a very dangerous wound that needed eight stitches in the race’s medical center. However, the rider went to rest convinced to take the start in today’s stage, the first part of the marathon between Belén and Chilecito. However, the mandatory medical examination in the morning recommended that the Spanish rider stopped racing to avoid the risk of having the wound reappear even more gravely. 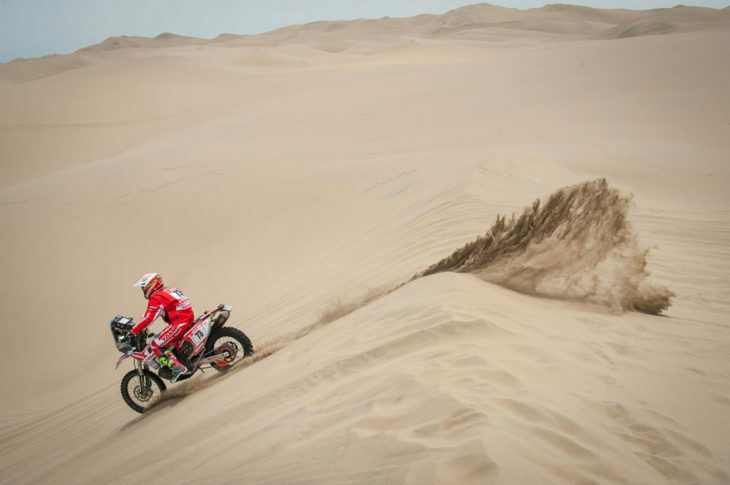 Sad and frustrated, Rosa Romero is forced to abandon a Dakar in which she was once again one of the great heroes of the toughest race in the world. Rosa Romero will return to Spain in the next few hours to recover. All of the HIMOINSA Team members send their support and wish her a quick recovery, thanking her for the effort and camaraderie and, above all, show great respect for the courage, strength and determination she showed during the 10 stages she completed without making a single mistake.